It has been a long time since the duo of meat adventurer’s have embarked on a journey of meat exploration. It was time to team up with my mentor the Reverend Biggles and go on a Meat Adventure to the recently opened ‘The Local Butcher Shop”. 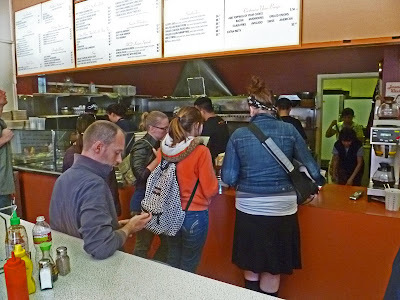 This adventure would take us to the famous gourmet ghetto of Berkeley California. 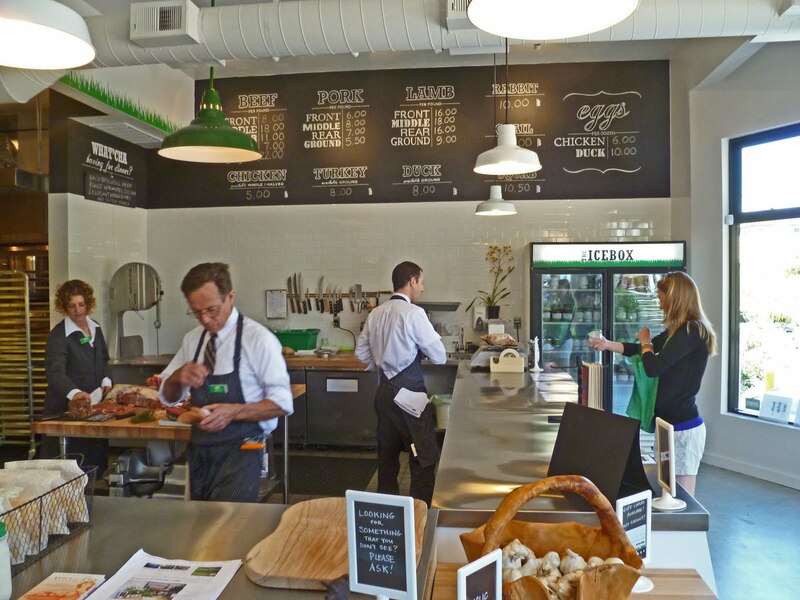 This area is a foodie’s paradise since it is home to: Chez Panisse, ‘The original Peet’s coffee shop, ‘The Cheeseboard Collective’ and numerous high end food establishments. 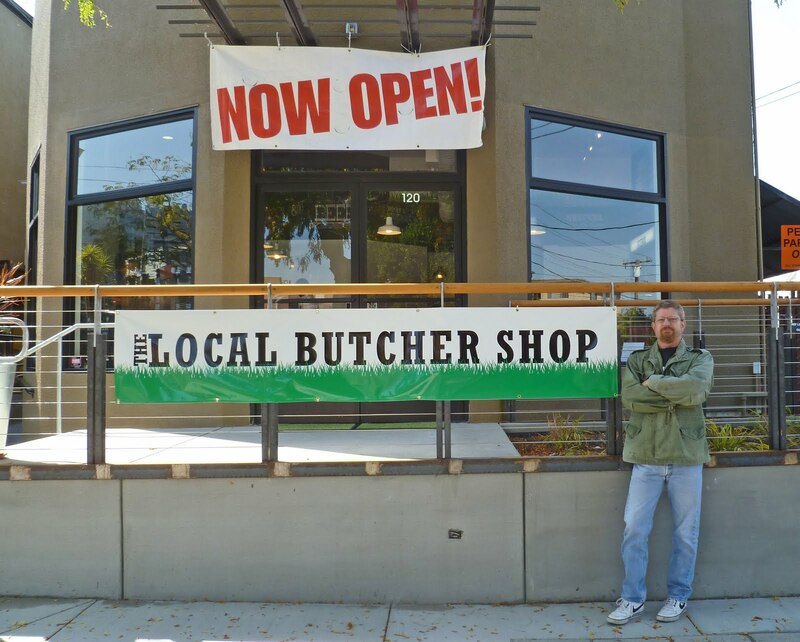 The Local Butcher Shop should be a welcome addition to this delicious neighborhood. We stepped into this meat emporium and were greeted by a naty attired friendly staff. We surveyed the meat cases and saw well marbled assortement of meat. House made made beef chorizo and knockwurst were displayed.There was a large butcher block in the center of the store which the cut of the day was being broken down to manageable size pieces. 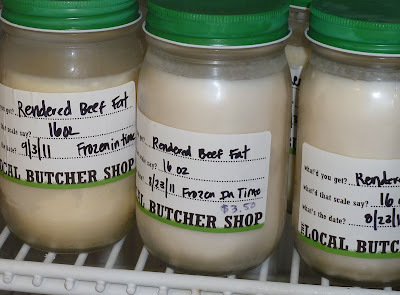 A refirgerator was stocked with house rendered beef and pork lard. Eggs and some select dry goods were also for sale. This was one clean meat shop. We noticed that there was no prices listed with the meat in the display cases. 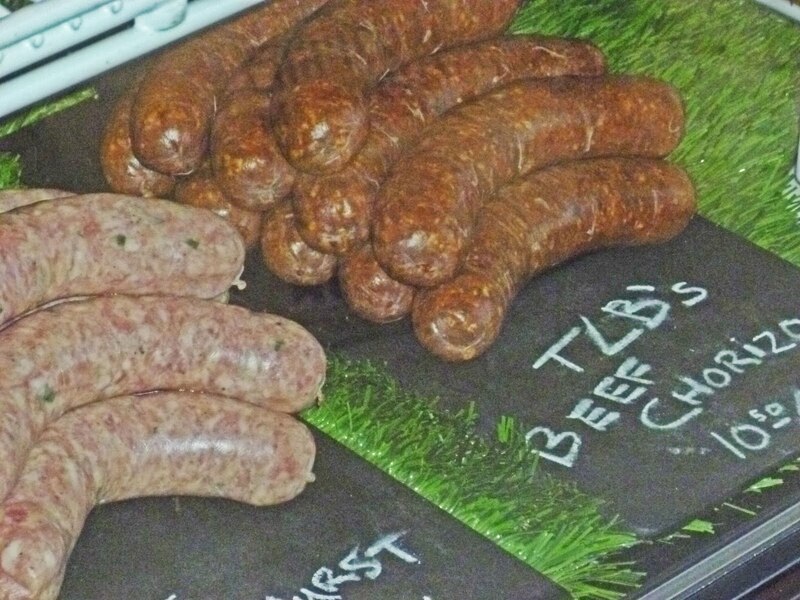 There was a chalkboard on the wall which had written categories of beef, pork, lamb and rabbit. The categories were then broken down to: rear, middle and front with prices attached. We asked for a little assitance in this unique pricing system. We were informed that meat cuts will come from certain areas of the body. For instance the beef rib roast will come from the center. You then look at the wall for Beef, and the center price. This is great if you know your meat anatomy. Fortanately there are charts and friendly people to assist you. 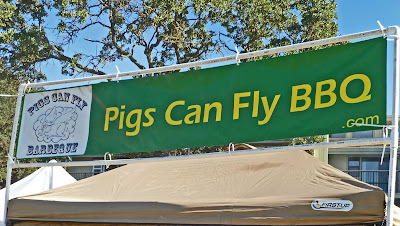 We made several purchases and left this new meat establishment. I had my eye on some beautiful seven blade roast. It was so well marbled and was calling me. I could not justify the forty five dollar price tag for this pot roast. The Local Butcher Shop is a very clean and unique place to get your meat on. It is a good fit for the neighborhood. 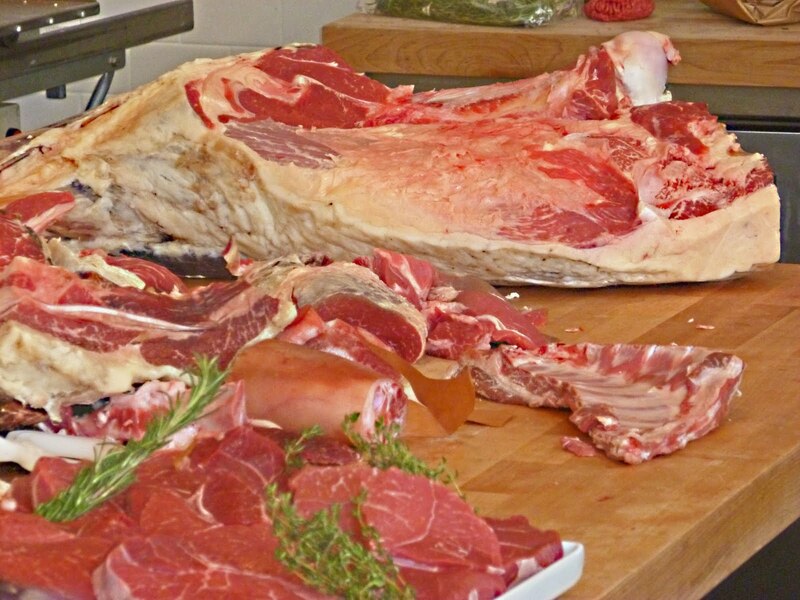 If you visit be prepared to pay premium prices for being able to bring home premium cuts from free roaming, pasture raised, and happy life meat. We shall return to purchase the pot roast some other day but it will be for a special occasion. We have been having a lot of fun with our home grown Japanese corn. 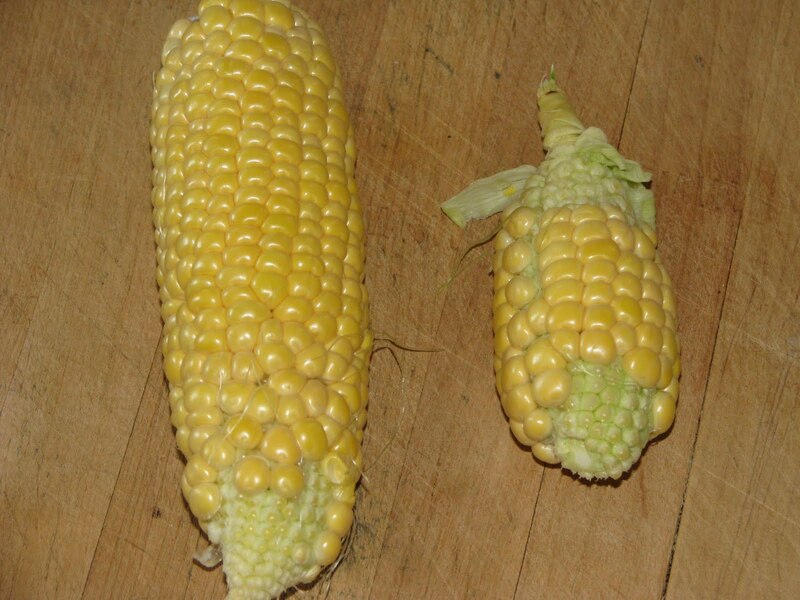 I would not say the flavor was much different than store bought corn, but the fact of being able to harvest and eat it with in minutes of picking does make a huge difference. These kernels explode with sweet corn milk that is a special treat. Boiled, steamed, corn cakes, corn bread, corn chowder are all my favorite corn dishes. Today we will make a corn pizza with crème fraiche, and pepper jack cheese that will be baked in the wood fire oven. This combination sounds good so let’s build a fire and make some pizza. One of my secrets to making good pizza dough is the slow rise. The dough is made the day before and held in the Chilebrown ice cave. A couple of hours before baking it is brought to room temperature to rise some more and rolled into the desired shape. 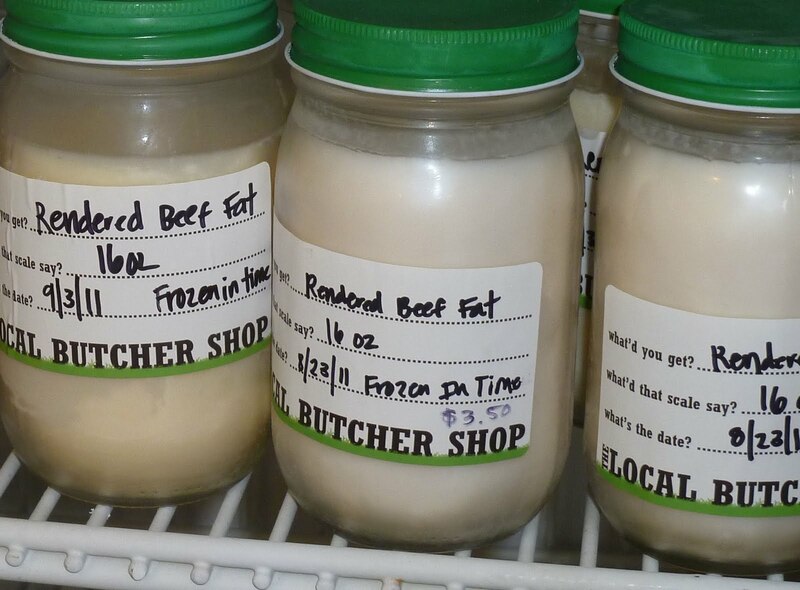 Fresh house made ‘Crème Fraiche’ was purchased at the Market Hall in Oakland. I received a little sticker shock on this price tag. A future crème fraiche making project at home is in the works. It sounds easy enough because it is a combination of heavy cream and buttermilk that is aged overnight. 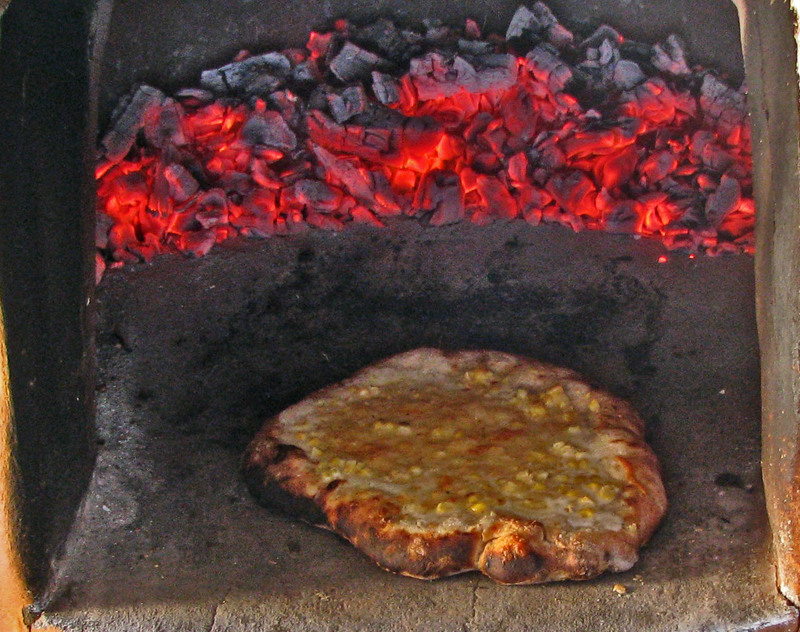 The pizza was assembled and cooked by a wood fire. A Dean Martin album was put on the record player and I burst into song. I knew Ms. Goofy would want Dean and I to sing a duet of ‘That’s Amore’ while trying some of this non-traditional pie. This corn pizza pie was very rich with the crème fraiche. 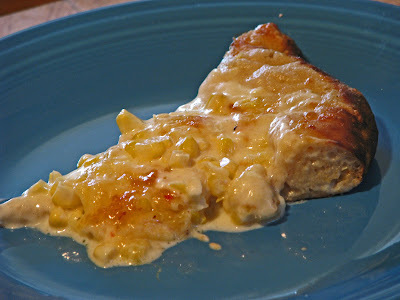 The corn with it sweet milky flavor made this almost a dessert pizza. The pepper jack added a little contrast to the sweetness. What fun we are having with our Japanese Corn! Ms. Goofy told me to can the singing but she sure loved the pizza. 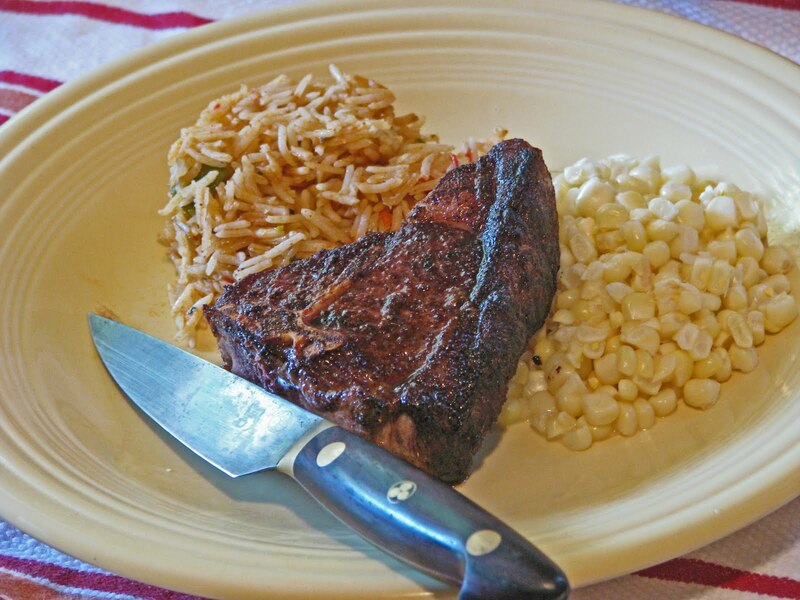 Some cute little lamb loin chops from ‘Anderson Ranches' were picked up from the farmers market. These chops were dusted with Berbere spice. 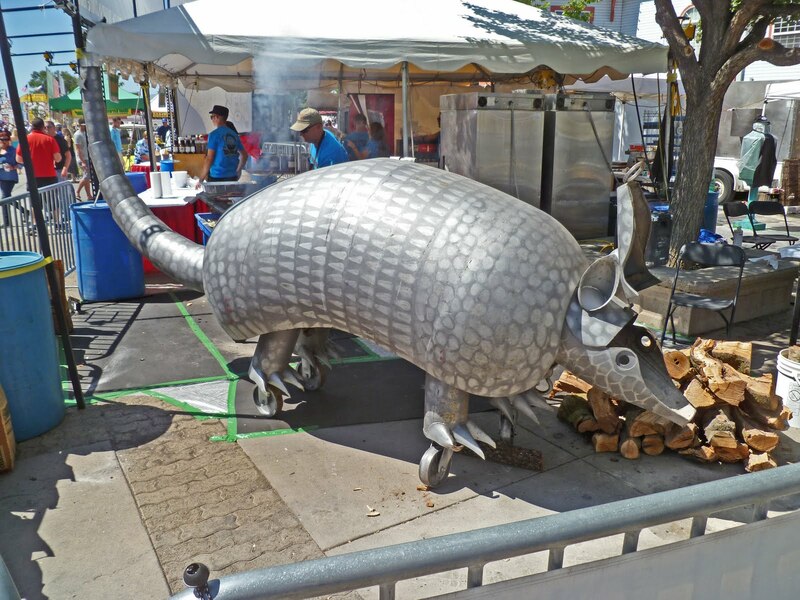 They were grilled on a hot mesquite fire until they were cooked medium rare. Tender and tasty with a unique spicy tang was the verdict. 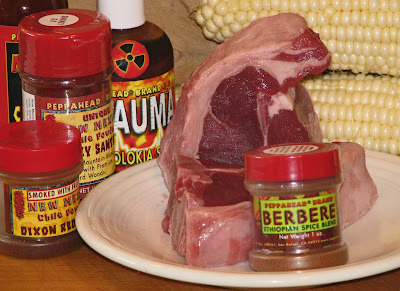 Berbere spice on its own is not hot in the heat department. There are spices that I am not overly familiar with in this blend. (allspice, fenugreek, cloves and several others) This was a unique flavor that I will have fun experimenting with on some other meats. I also loved our cute little lamb chops. Lamb will definitely make a return visit to the grill. Simple ingredients; pork belly, salt, maple syrup and smoke from applewood, make for some very tasty bacon. The wood from the apple tree combined with fire produces a slightly sweet smoke. 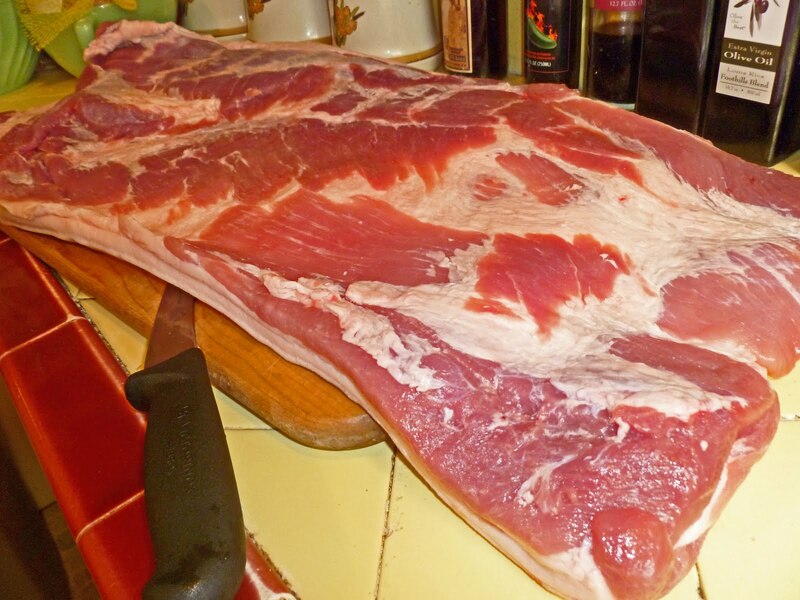 This will add a smoky perfume that will penetrate and transform a marinated piece of pork. 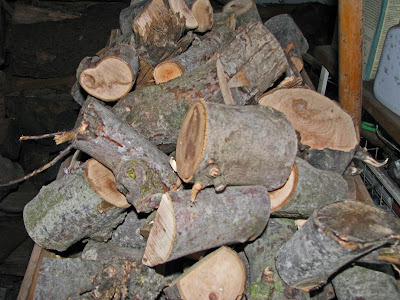 Only four chunks of this wood will be used to smoke our belly today. It does not take a lot for this wood to work its magic. 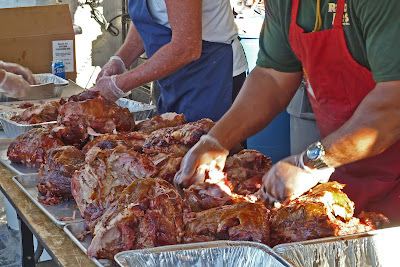 The pork bellies were coated in a slurry of ‘Morton’s Sugar Cure’ and maple syrup. This salty sweet mix was stored in the Chilebrown ice cave for a week. Every other day the bellies were turned to insure even curing. At the end of the week the bellies were rinsed and returned to the ice cave to form a pellicle. Five hours in the smoker at 200 degrees or until the internal temperature reaches one hundred and fifty degrees and we were done. Today’s belly was from a cross bred Duroc pig procured from Bledsoe farms. I believe the applewood played a large part in the final flavor. Smoky but not overpowering combined with maple syrup creates a flavor that can not be beat. This bacon was a salty treat. 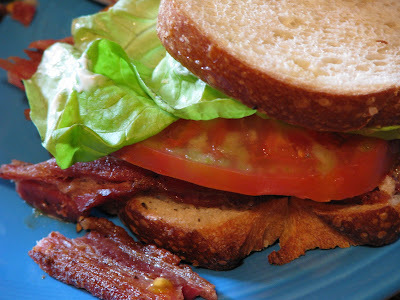 Home grown tomato’s with home smoked and cured bacon is a signature Chilebrown meal. 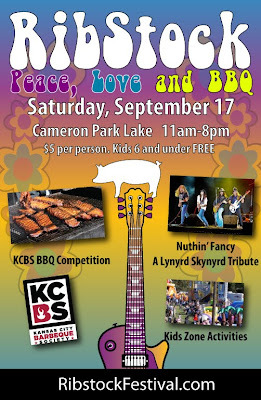 Peace, Love and BBQ is what it was all about in Cameron Park California this weekend. 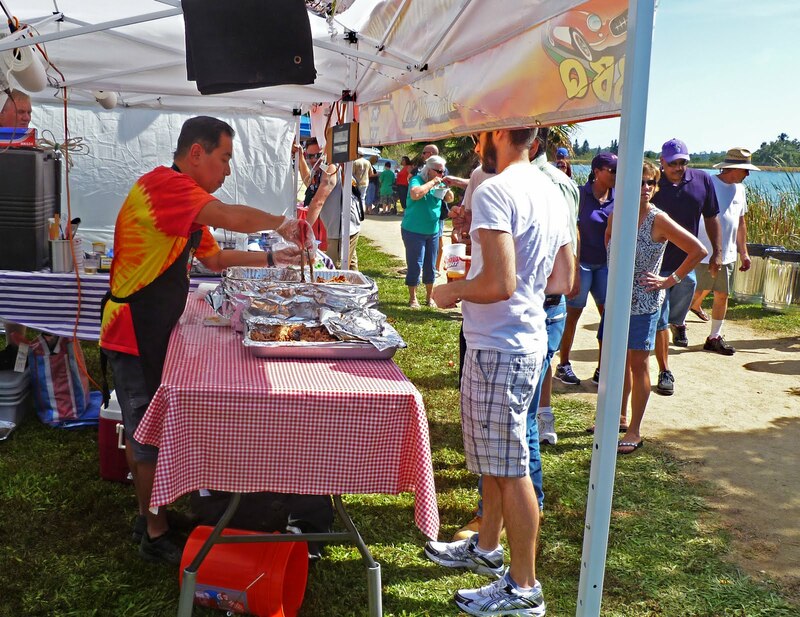 Sunny skies greeted this barbeque competition situated around a small scenic lake. 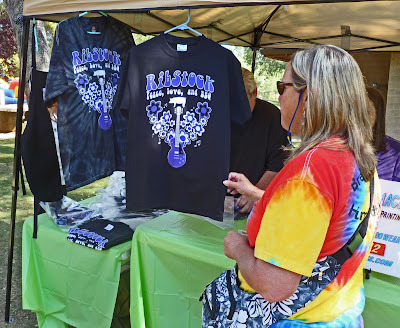 Tie dye and sixties garb was the preferred costume of the day. 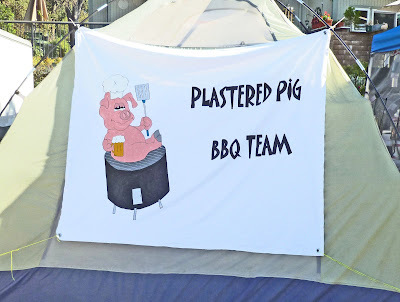 Ms. Goofy got into the spirit and even added another t-shirt to her collection Thirty nine professional teams cooked the four meats of: Chicken, pork ribs, pork shoulder and brisket. Today there was a special division called the “Backyard Division”. 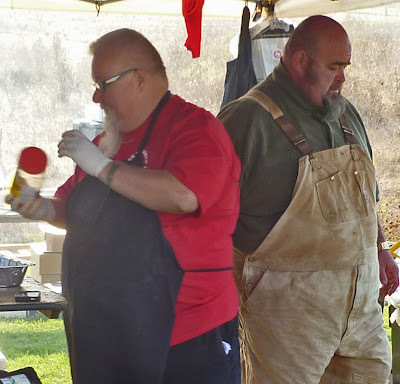 These competitors only cooked chicken and ribs. 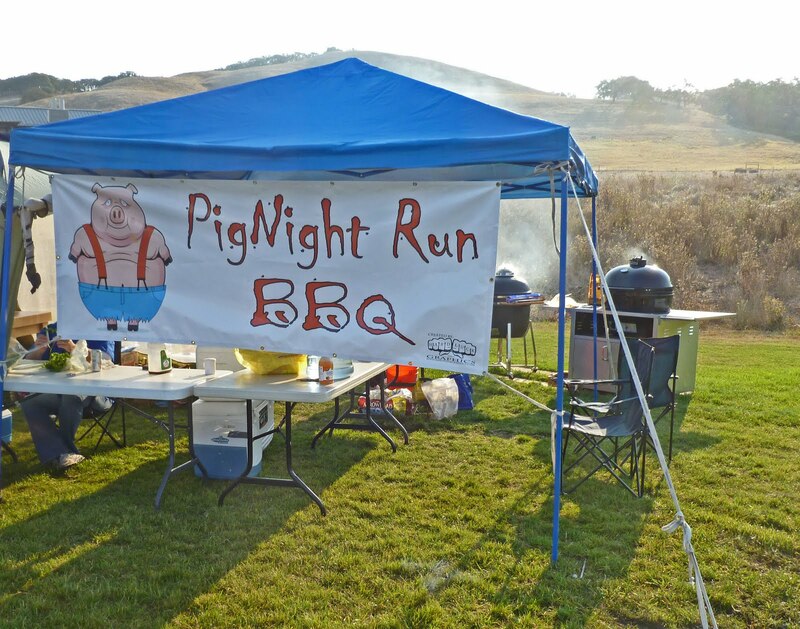 Whatever was cooking, a delicious smoky haze of flavor permeated the event grounds. 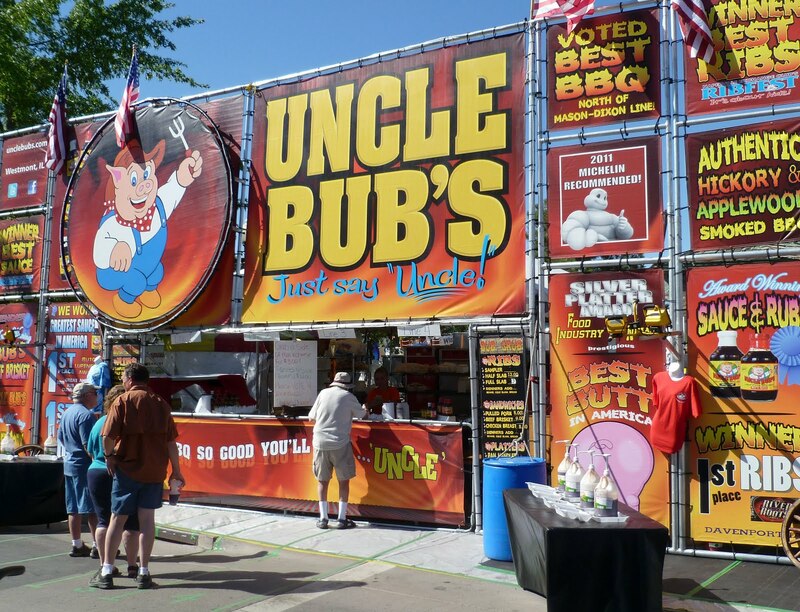 You could not stop the drool and anticipation of tasting some of the best barbeque to be found. 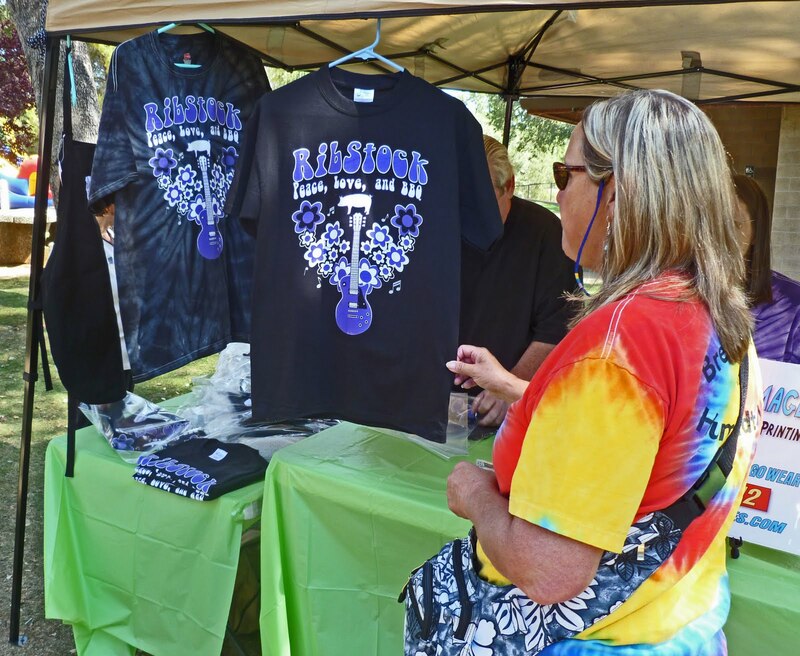 The public was treated to crafts and music to entertain while tasting the barbeque. There was a special area full of slides and jumpy things for the children. The hungry crowd was allowed to taste and vote for the Peoples Choice award. Smiles and barbeque sauce was plastered over the faces of everyone. 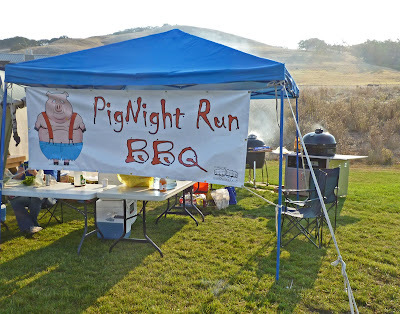 This was a great way to sample competition style barbeque. I always get a kick out of seeing all the different cookers. 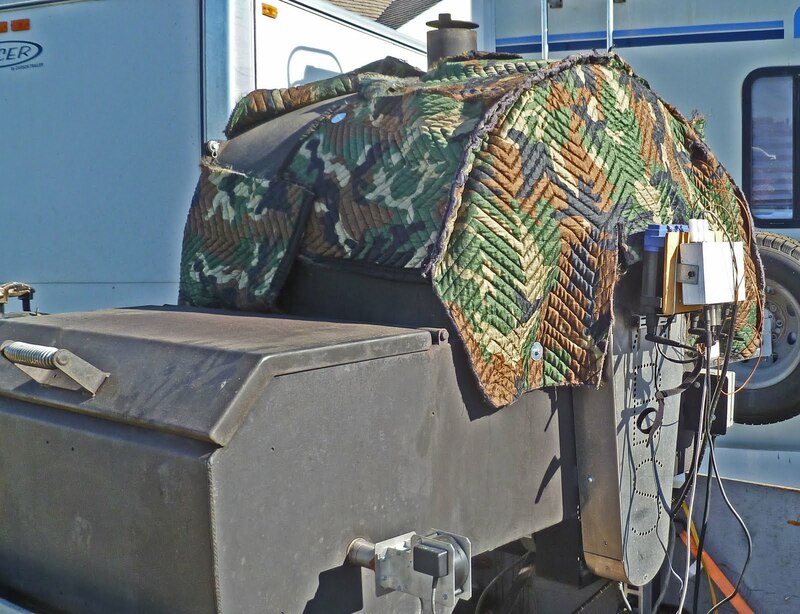 You will notice the camouflage barbeque cover. I am still trying to figure that one out. Ms. Goofy and I were wearing our judge’s badges today. I was also wearing a three week growth of facial hair. Ms. Goofy and I were sitting at different judging tables as required by KCBS rules. We did work out a hand gesture signal so she could tell me when barbeque sauce was all over my hairy mug. It is possible a couple of planes landed with all the hand gestures Ms. Goofy was sending. What a wonderful task we have of judging such tasty and delicious food. Once again we were not disappointed with today’s entries. ‘Ribstock, Peace, Love and BBQ” is a great event. A special shout out to Ed Anhorn who coordinated this fun festival and competition. The Grand Champion winner today was “Big B’s Down N Dirty BBQ”. 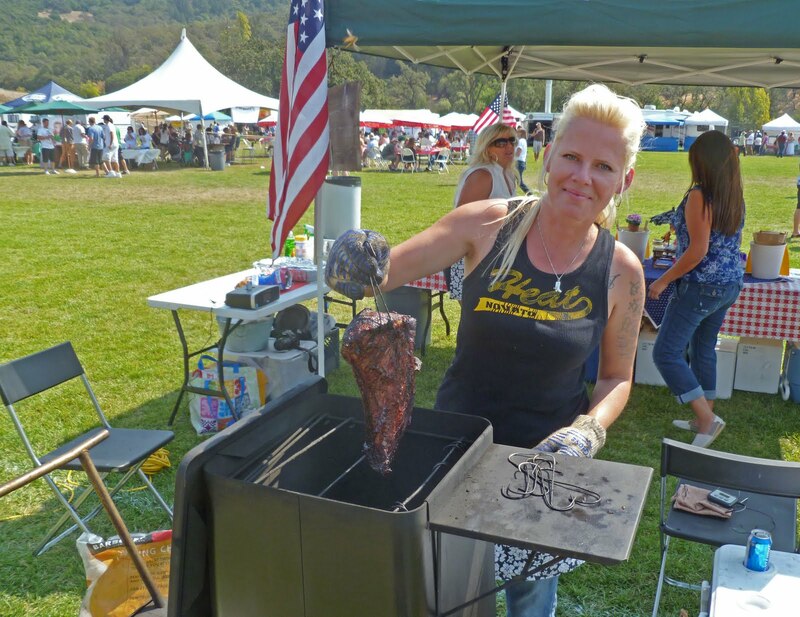 We would like to mention our friend, Donna Fong from ‘Butchers Daughter BBQ, took first place in brisket. This is her rookie year and she is a rising star. Everybody this weekend was a star! I have been on a short sabbatical from the salt mine. Besides growing a beard, I have not been just smoking cigars and watching Captain Kangaroo. 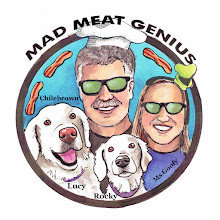 I have been doing exhaustive research for you, the Mad Meat Genius readers. 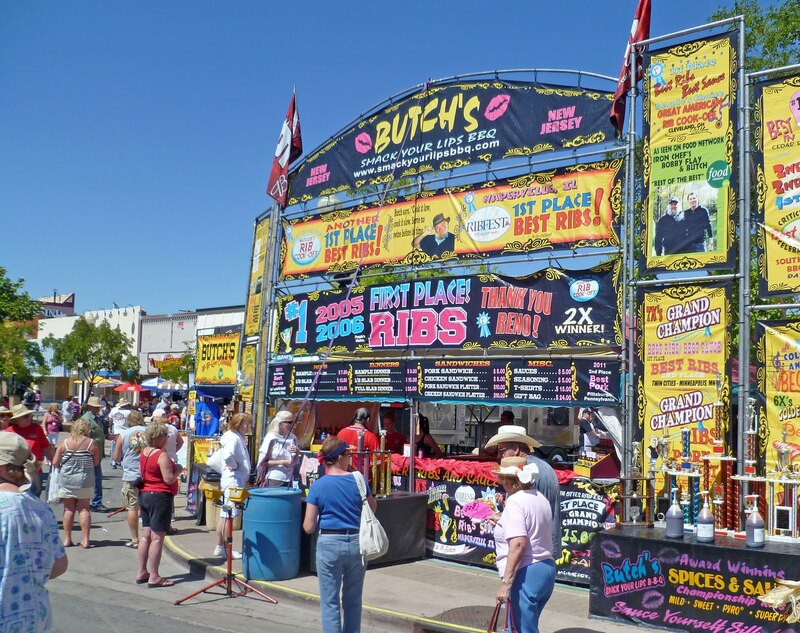 Today brings us to the city for chicken fried bacon at the “Buckshot”. The Buckshot is a local watering hole that occupies the former digs of “Pat O’Shea’s Mad Hatter. Their infamous moniker was “We cheat tourists and drunks’. I bellied up to the bar and ordered a cold one and some chicken fried bacon. It tastes just like you would imagine: salty, a little chewy and oh so greasy good. 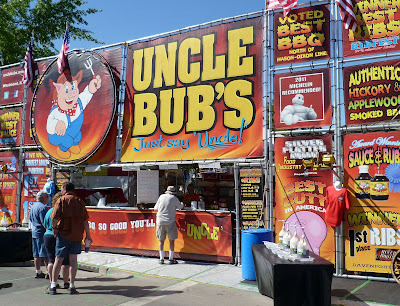 The first one dipped in a combo of ketchup & mustard and then drizzled with maple syrup was pure heaven. The second piece was a little decadent. The sweet maple syrup enticed me to finish off this plate of breaded swine. After this act of gluttony I was destined to the couch to see if the Captain had been ping pong ball dropped by falling for Mr. Moose’s ‘Knock, Knock’ jokes once again. You probably thought we eat nothing else but barbeque and you are close to being right.. Once in a while we like to take a breather and have a nice dinner with some good old fashion, old school elegance that includes large steaks, multiple flambéed dishes and a good stiff drink. Harrah’s Steak house fits this ticket to the tee. This Harrah’s Casino is located in Reno, Nevada. This destination restaurant has a flavor and ambiance that brings us back to an era of tuxedoed waiters, dark lighting, no cigars anymore, but new/old charm that we love. 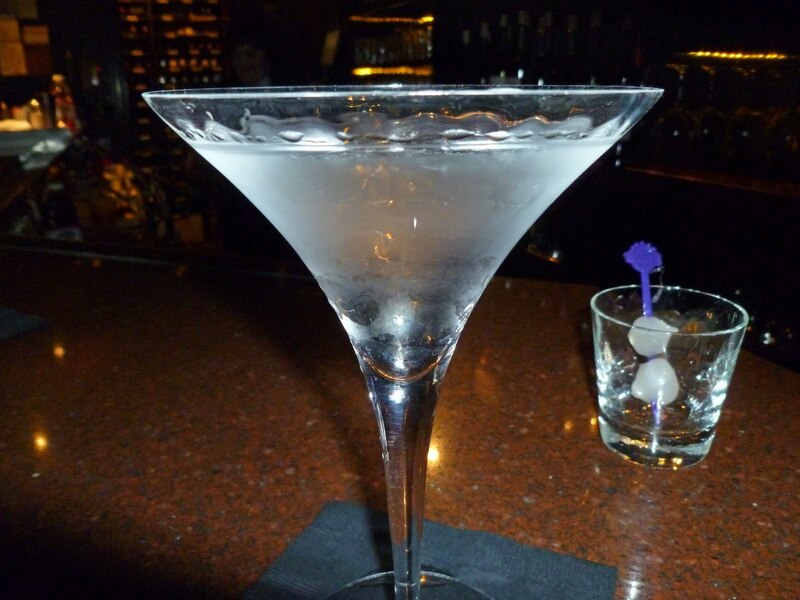 The first step of going to a steak house is going to the bar. The perfect martini years back may have been gin but today our drink is Stolichnaya vodka with a bottle of vermouth that has been opened and shook to just put a little essence in the air. You really do not want vermouth in your drink and it is really just a nod to bad gin in the past. If you are a Lady the bartender will carry the drink to your table. 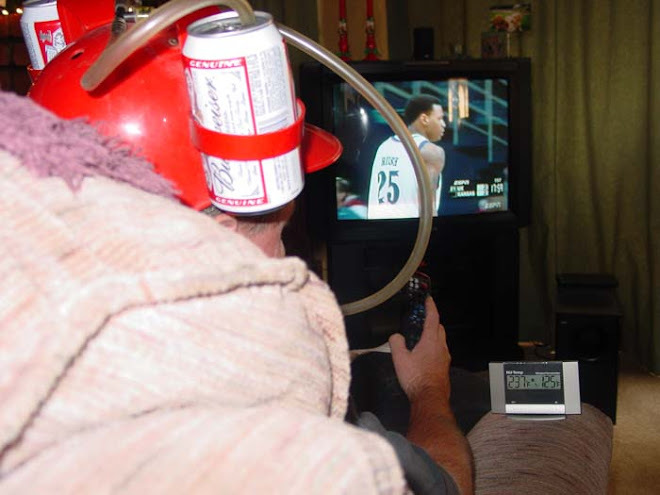 Men should be able to handle this task on their own. We made it to our table safely and pondered the menu. There are no surprises on this menu. Steak and maybe lobster combined with a big old potato and creamed spinach. Who could ask for more? 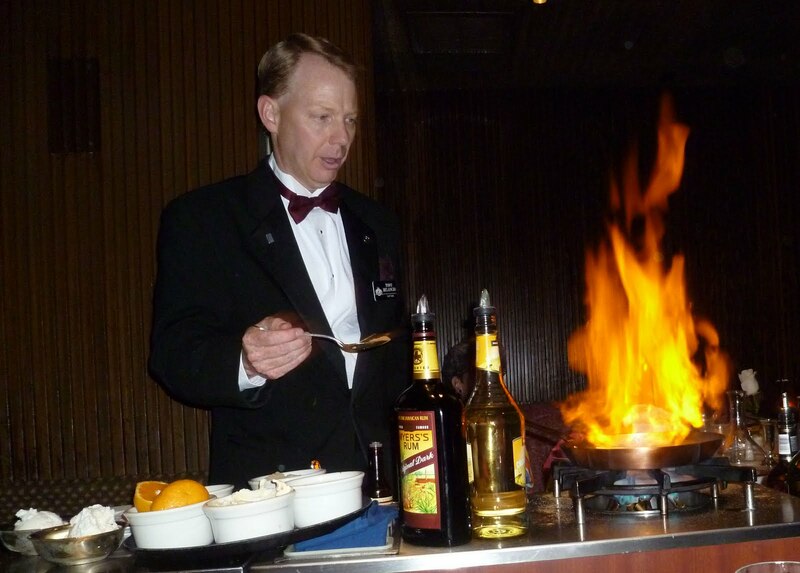 The great thing about Harrah’s Steak House is the show that the waiters put on. There are numerous dishes that require table side presentation; Caesar salad, Steak Dianne, Café Diablo and our choice of the night Bananas Foster. I tipped our server for extra flames and we were not disappointed. 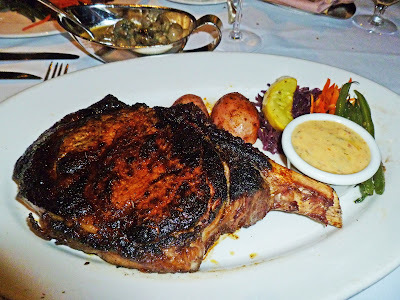 Harrah’s Steakhouse (Reno) is a destination restaurant. It will not disappoint. 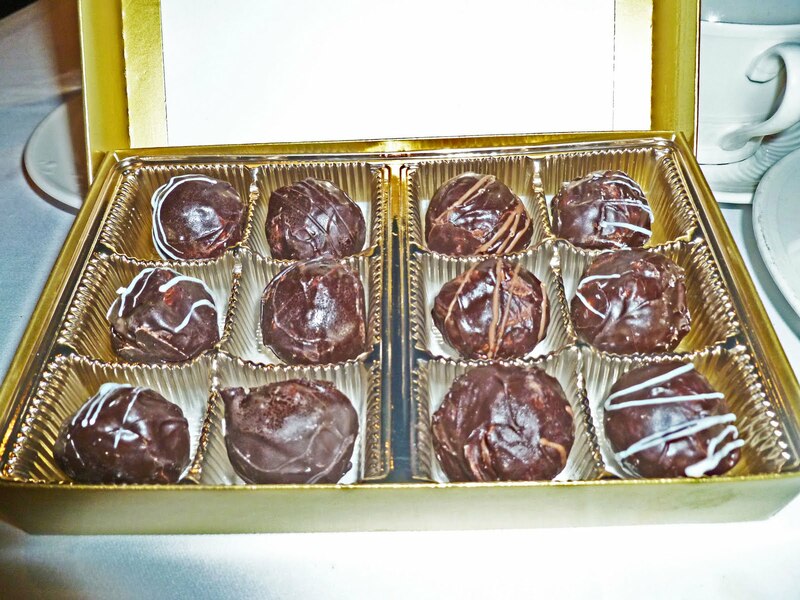 We left with a box of truffles and are anticipating our return. This may look like ordinary corn, but it is Japanese corn that I have grown in the back yard.. It is sweet, milky and has a corny taste that you will never get from the store. Pick it, pluck it, and throw it in salted water. Close your eyes and enjoy! Another beautiful day of smelling, watching, judging and most important of all eating World Class barbeque was had at the “Wine Country Big Q”. This event was held at the beautiful campus of ‘Sonoma Academy’ in Santa Rosa, California. This private school was located on the outskirts of Santa Rosa with scenic rural surroundings. 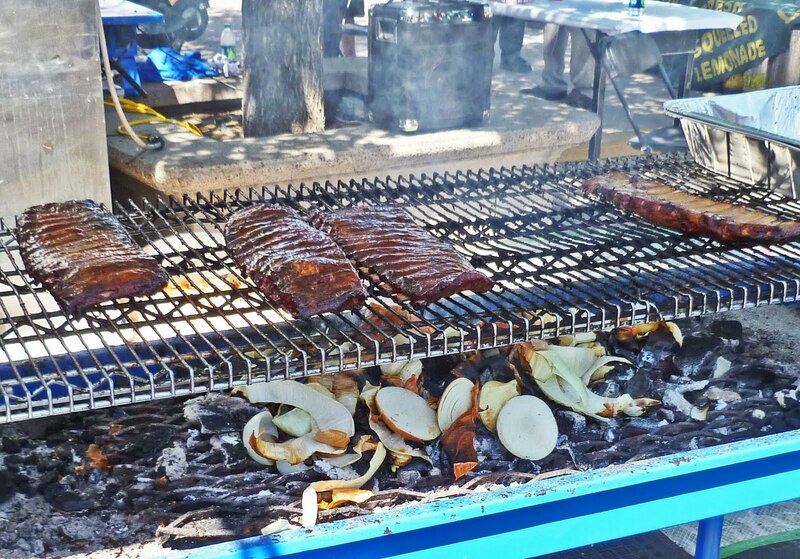 Twenty four teams participated in this contest of smoking and cooking the four required meats. 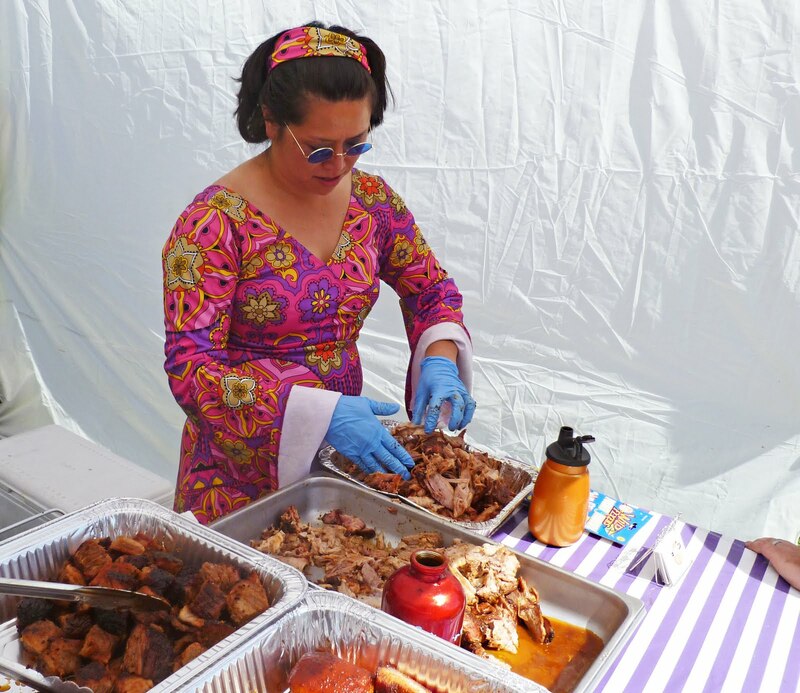 The Public participated by tasting numerous wines from different wineries that were paired with barbequed meat. 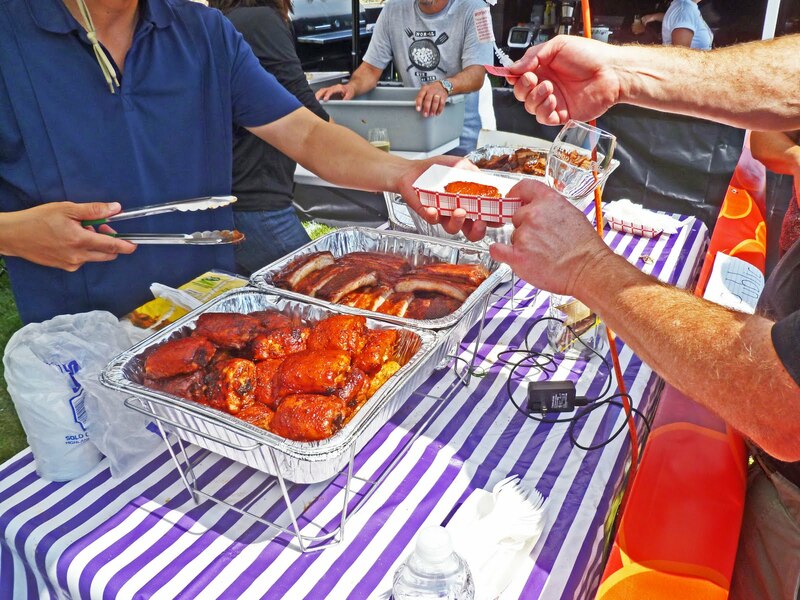 This hungry crowd also got to taste the bbq competitor’s samples and voted for the ‘Peoples Choice’ award. The weather could not have been nicer with sunny skies and the thermometer hovering in the low eighties. Music was flowing just as freely as the wine. We had to hold off on our imbibing because we had a job to do. We judged some of the best barbeque ever. It never stops amazing me how good meat combined with seasoning and a little smoke can be. We were not disappointed today. 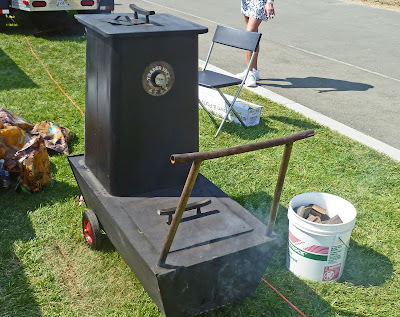 This little smoker caught my attention. 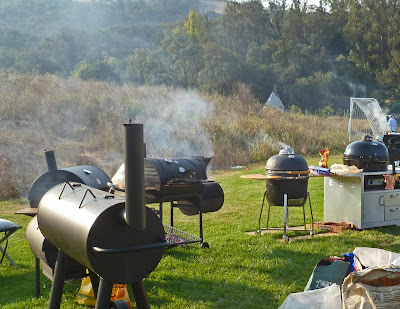 A wood fire is built in the adjoining chamber and meats are hung in the chimney area. There is a history of this small and old cooker. It was originally owned by the owner of ‘Trader Vic’s”. 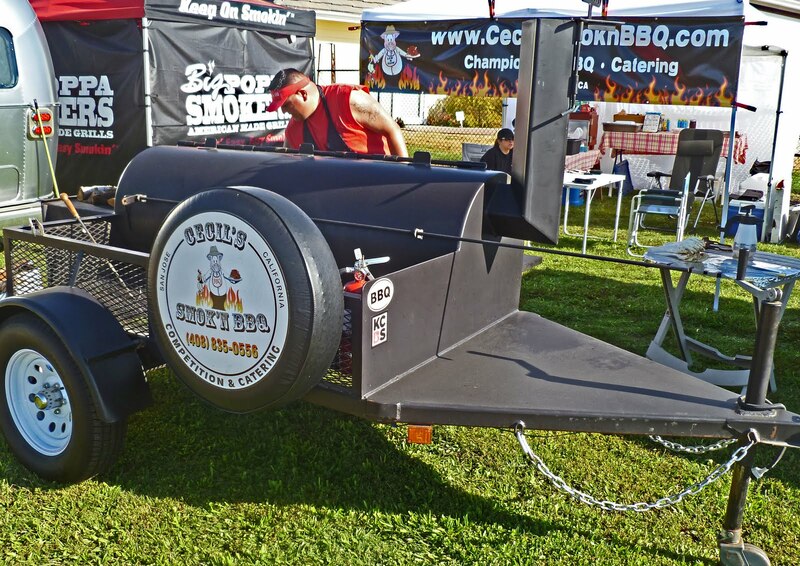 It is now being used by ‘Vic’s Chics BBQ”. They were using this cooker to smoke Tri-Tip and it was then paired with a local wine. Ray Lampe, aka ‘Dr. 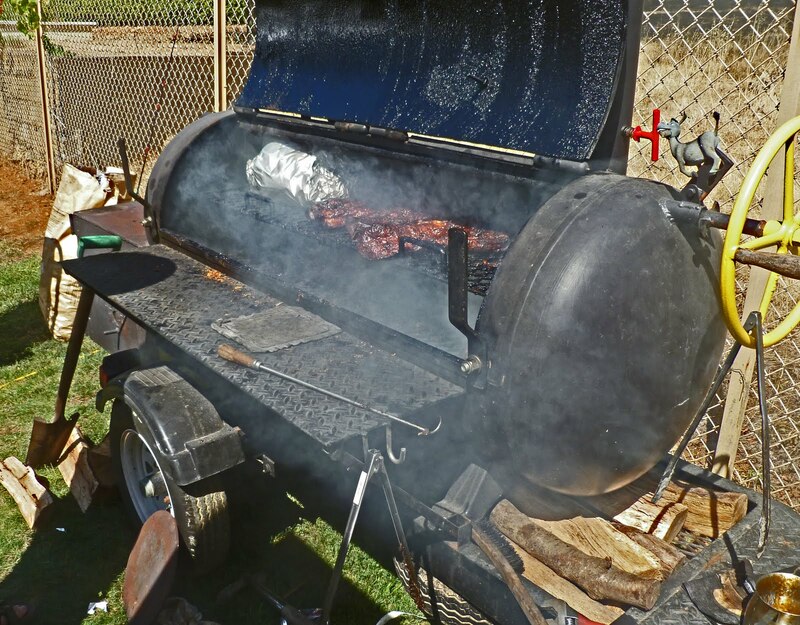 BBQ’ was in the house today. 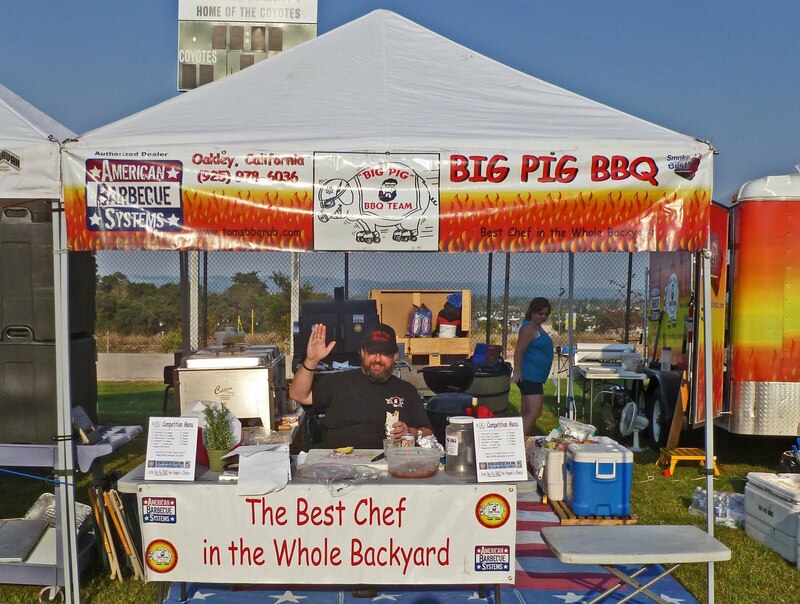 Dr. BBQ is a bbq author, TV personality and an award winning competitor. He was competing today with Guy Fieri’s team “Tex Wasabi’s All Stars. We did not spot Guy in the crowd today possibly because he may have been at Tex Wasabi’s which is located a couple of miles away. 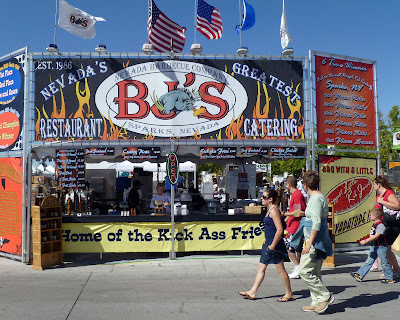 ( Guy Fieri did show up later.) Dr. BBQ is a larger than life celebrity that was very friendly and personable. Yours truly did not miss this photo op. 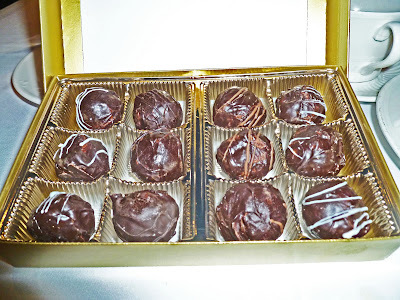 Today’s proceeds benefited an organization called “Worth Our Weight”. This was a fun event for everybody involved. A special thanks to Judy Groverman-Walker and all the volunteers that made this a great event. Congratulations to all the competitors for cooking some great barbeque. A special shout out to the Grand Champion winner ‘Tex Wasabi’s All Stars”. 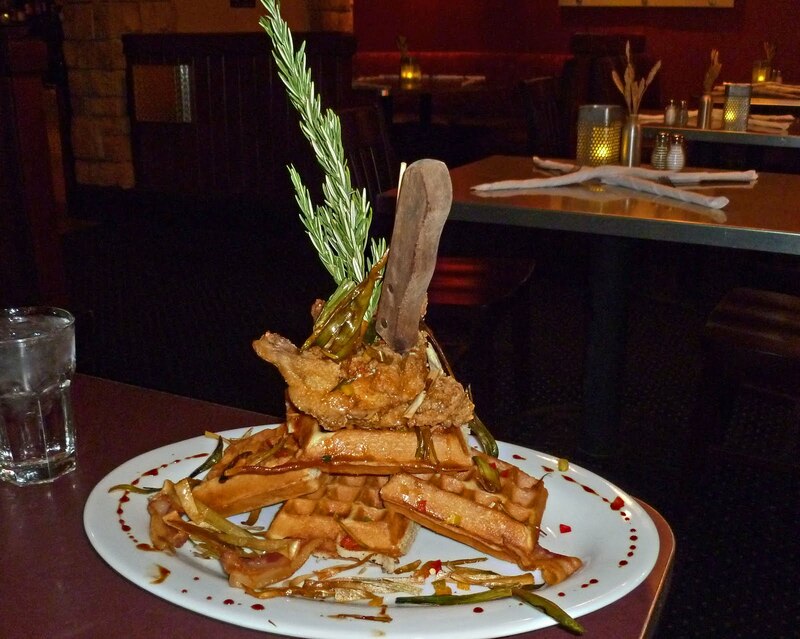 “Twisted Farm Food”, unique presentations, oversized proportions, and a whole lot of dishes with bacon is a fun restaurant called ‘Hash House A Go Go”. 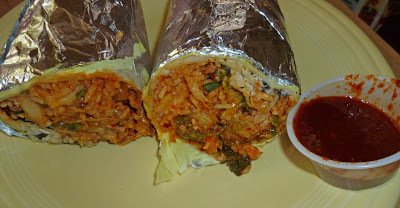 This restaurant has been featured on numerous travel and food shows. They originated in San Diego and now have branches all over. We visited the Reno location situated in Harrah’s casino. It was a long journey over the ‘Donner Pass’, so we had a powerful thirst. We bellied up to the bar for bacon cocktails. 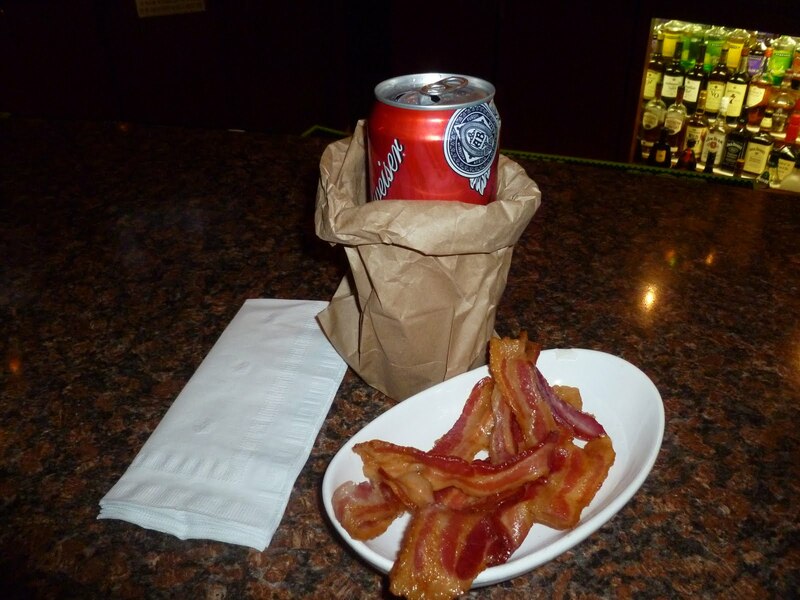 Ms. Goofy had a ‘Bacon Bloody Mary’ and I had a frosty cold beer served in a brown paper bag and a side of bacon. I think we have found our new favorite watering hole. Ms. Goofy’s drink was basically a ‘Bloody Mary’ with the fixin’s of a BLT on the side. It was served in a very large salt rimmed glass. My beer served in the ‘wino bag’ had a side order that included seven pieces of salty oily bacon. Ms. Goofy finished her drink in no time flat and was ready to dance. We danced our way to a table. 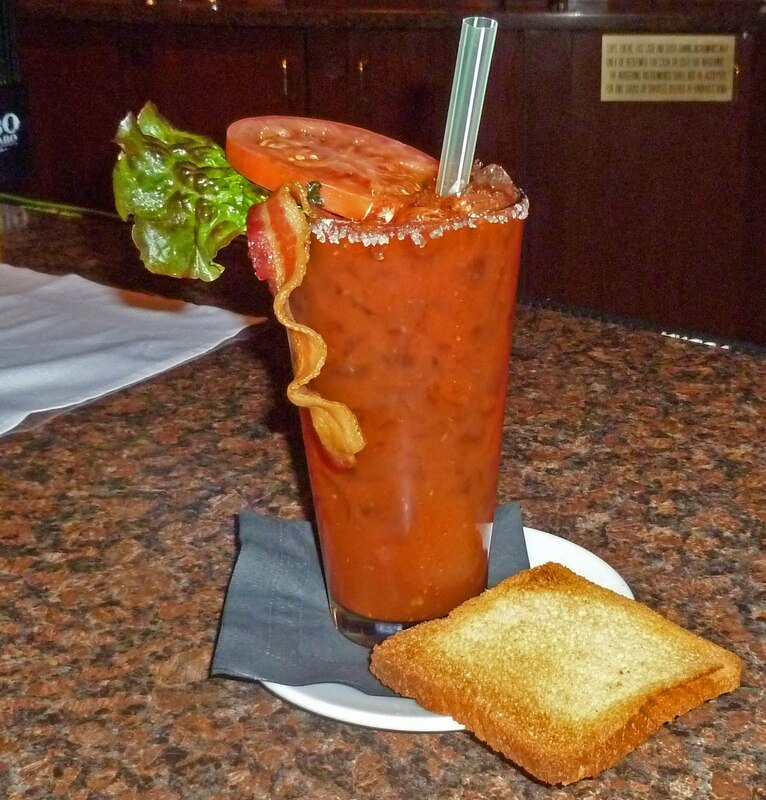 ‘Hash House A GO GO’ is a fun place to belly up to the bar and have bacon infused/influenced libations. It was a fun place to visit and the meals are large. 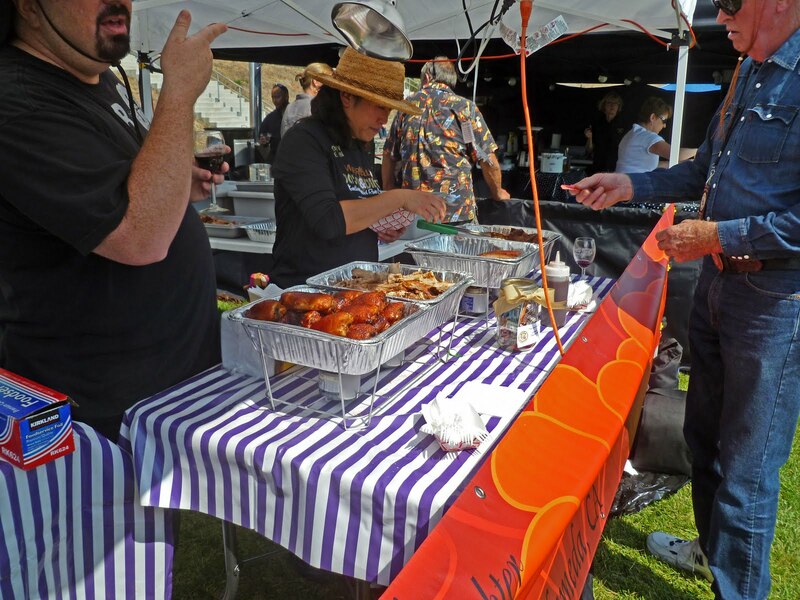 A rendezvous at the Davis Farmers market with John Bledsoe produced a beautiful thirteen pound Duroc cross bred pork belly. This swine undercarriage will be transformed into some home cured, with salt, maple syrup and apple wood smoke, bacon. 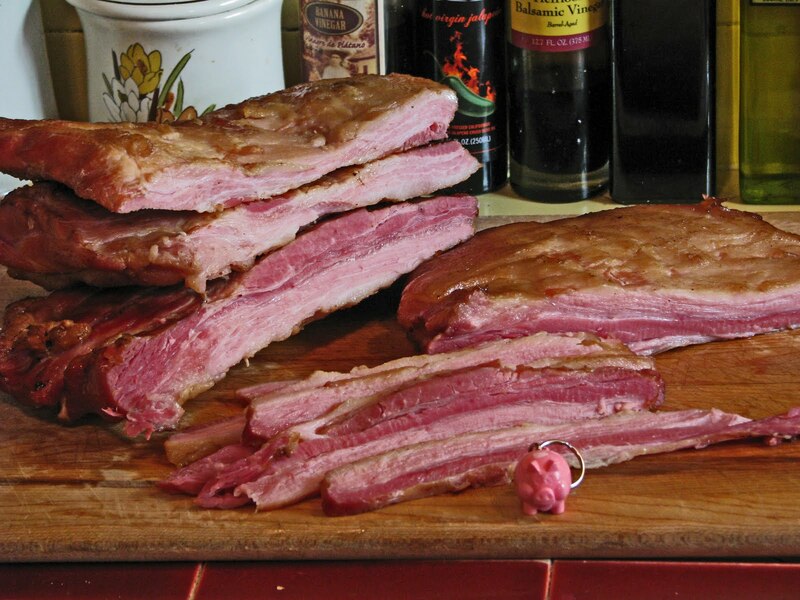 My personnel preference is to make bacon without the rind or skin. It will retain more smoke and it is easier to slice. Mr. Bledsoe does not have a rind removing machine so our rind was intact. Luckily, we have very sharp knives. The skin was removed and it seemed like such a waste to toss it in the trash barrel. Let’s make some cracklins. This will be a Mad Meat Genius first. Some research was done on the World Wide Web and some general guidelines and recipes were found. Everybody has their version and methods but some general rules should be followed. They are not called Cracklins for nothing. 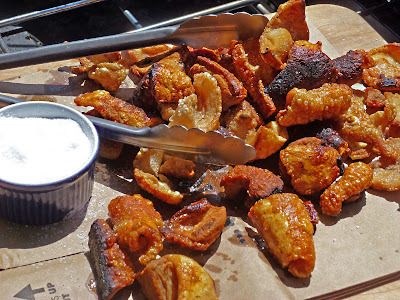 This is only fried pig skin but when they are cooking they sputter, pop and splash very hot pig oil all over the place. 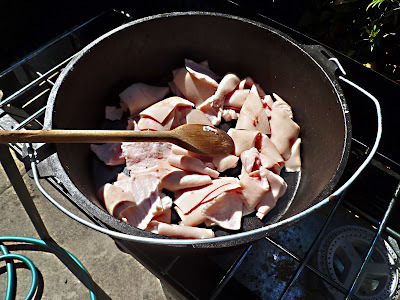 There also is a very unique odor that will be generated from this cauldron of bubbling piggy fat. 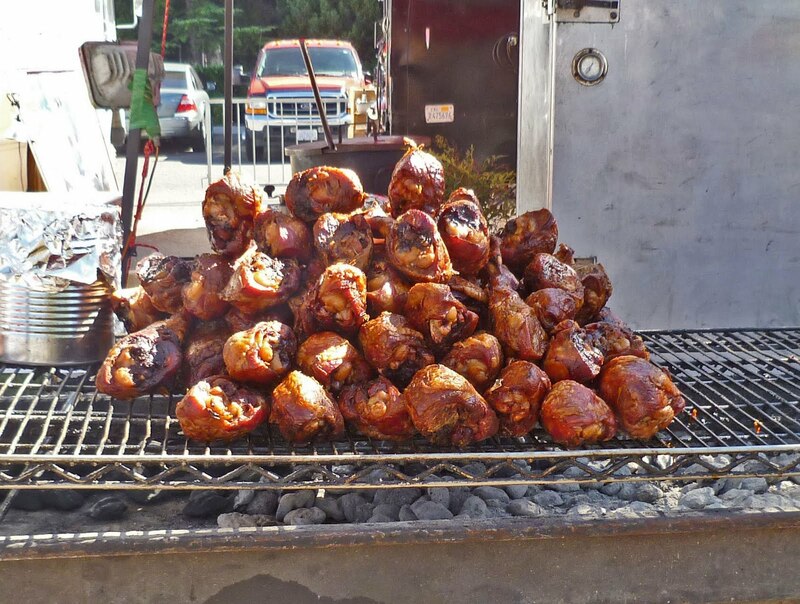 Unless you want your house to smell of this odor it is a good idea to cook it outside. A heavy thick pot, black iron for us, will help with the cooking. We decided to cook our cracklins outside in our large cast iron pot on a portable propane stove. We also had a fire extinguisher and a water hose standing by. 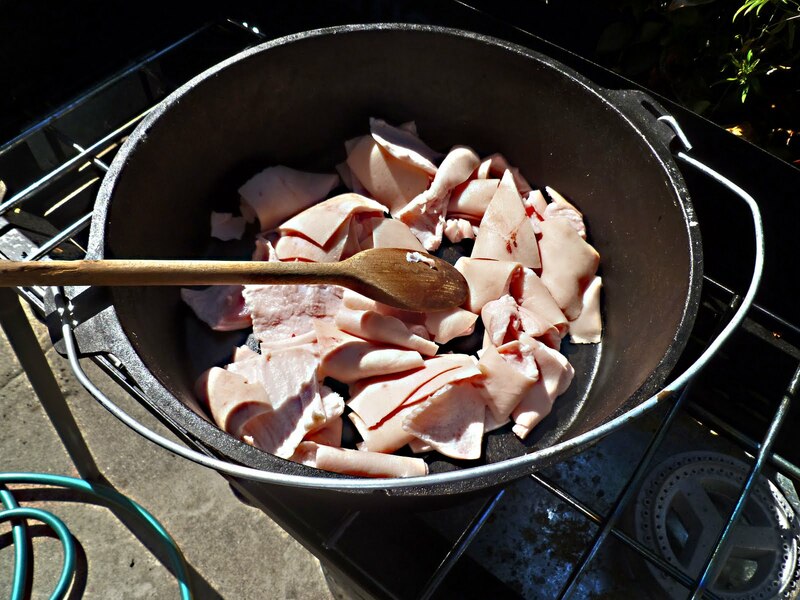 The rind was cut into large squares and simmered in their own rendered fat until puffy and crisp. While still hot and glistening with fat they were dusted with kosher salt. 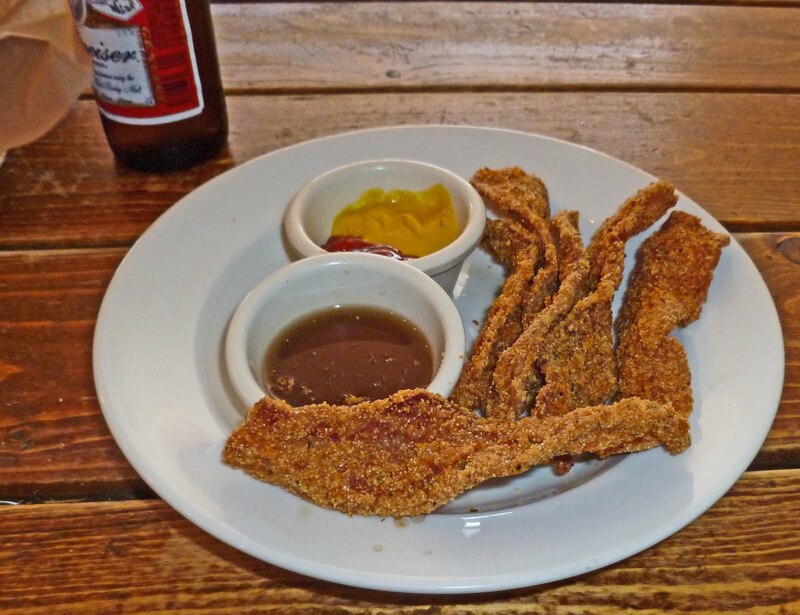 You know, cracklins are a guilty pleasure that must be experienced. Salty, crispy and an addicting pork flavor will be your reward for your effort. 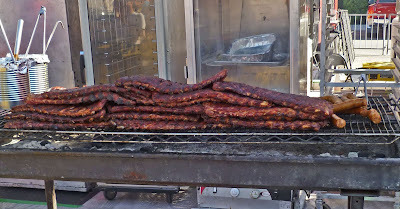 Some pieces had a little meat attached to the crispy fried skin. 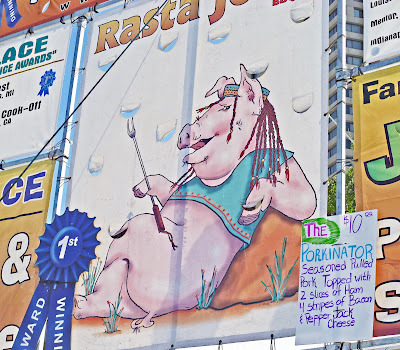 This was an added bonus to our porky fried snack. I am patting myself on the back for cooking them outside. Be very cautious if you attempt to cook cracklins because very, very hot fat will try to splatter you. Stay tuned for more bacon. 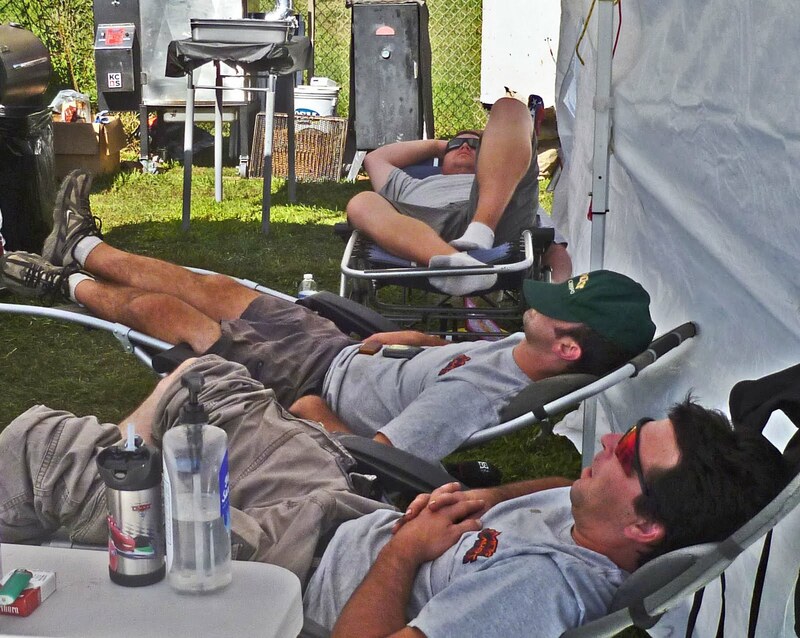 It was time to take a short break from our bbq judging duties. 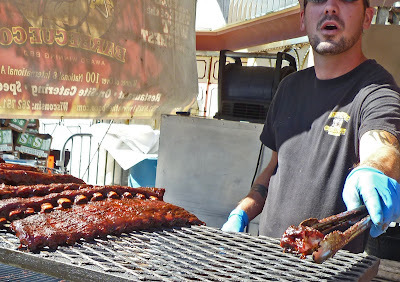 What better way to relax but by not judging but by participating as a consumer of ribs and barbeque at the ‘Nugget Rib Cook-Off” held in Sparks, Nevada. This is a six day festive event that ends on Labor Day. 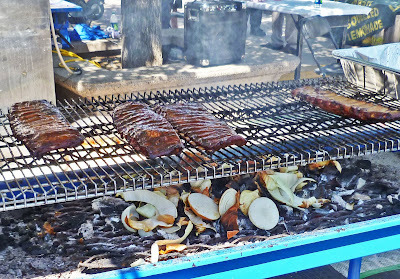 We spent two days eating and taking in the sights at this massive festival. You may notice I say festival and not contest. It is advertised as a contest and there are judges. There is an ‘A’ list of celebrity chefs and newspaper/TV personalities that I have never heard of. 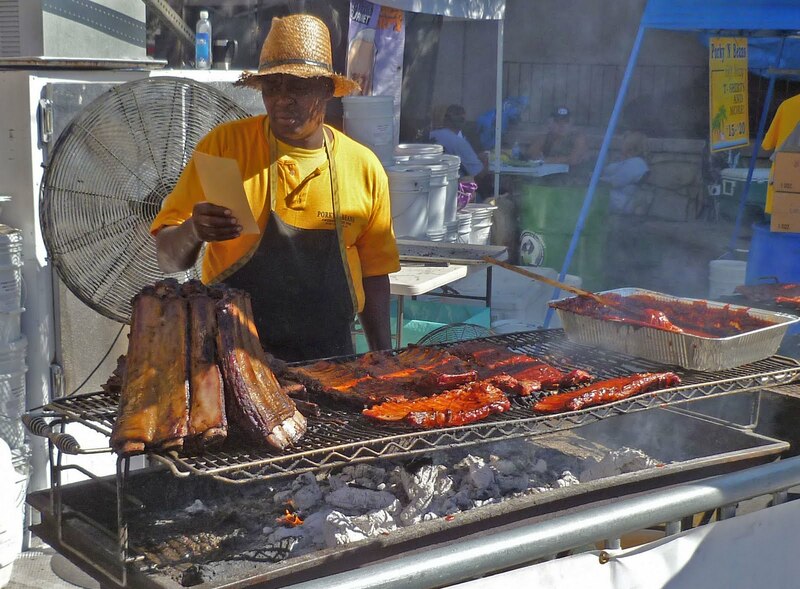 “Peoples Choice’ award will be determined by the rib eating and voting public. 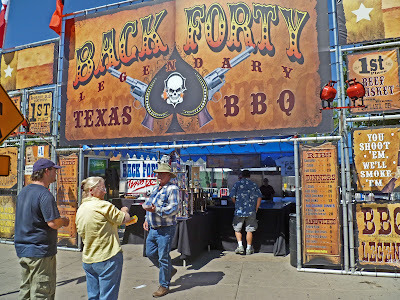 This event just seemed like a fun place to get your ribs on. 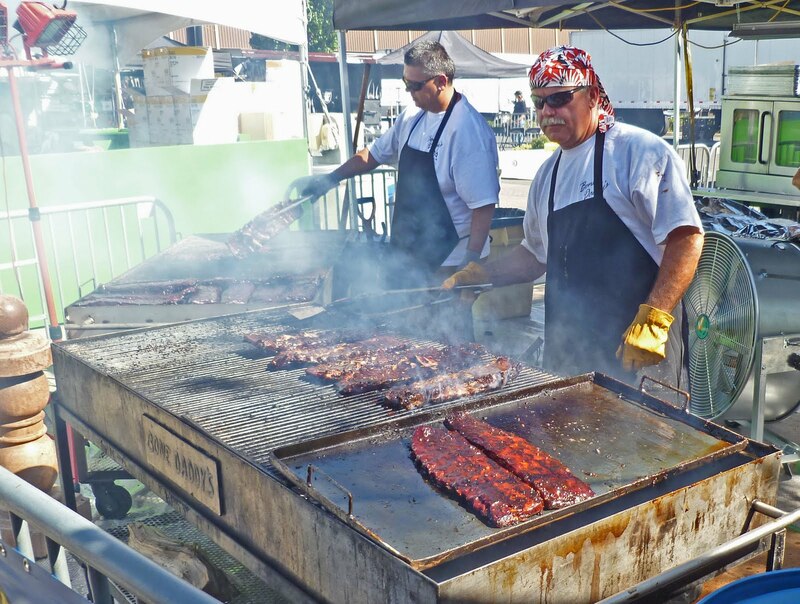 Twenty four cookers from all over the country will serve ribs and side dishes to the hungry masses. Our local ‘Kinders’ and “Back Forty’ will make their presence known at this collection of barbeque creators. 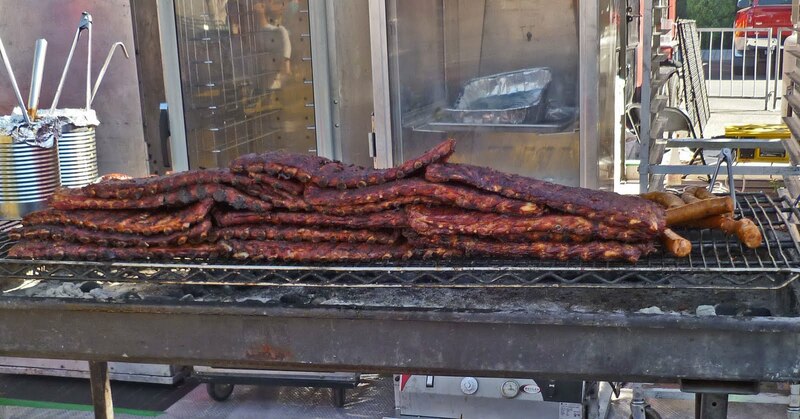 There was so much more offered to purchase than just pork ribs. Beef ribs, turkey legs, sandwiches numerous sides of cornbread and the infamous ‘The Porkenator” We spied this sign advertising this monster sandwich of seasoned pulled pork topped with 2 slices of ham, four strips of bacon and pepper jack cheese but were too scared to order it. 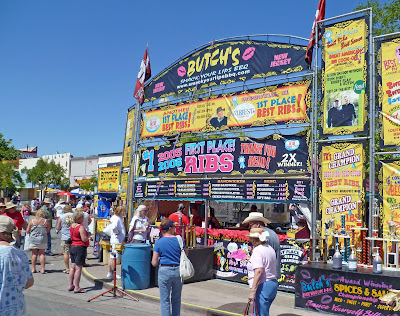 There was an assortment of deep fried items such as pickles, potato’s, onion rings and peaches. Walking through a haze of barbeque smoke definitely got the taste buds working. 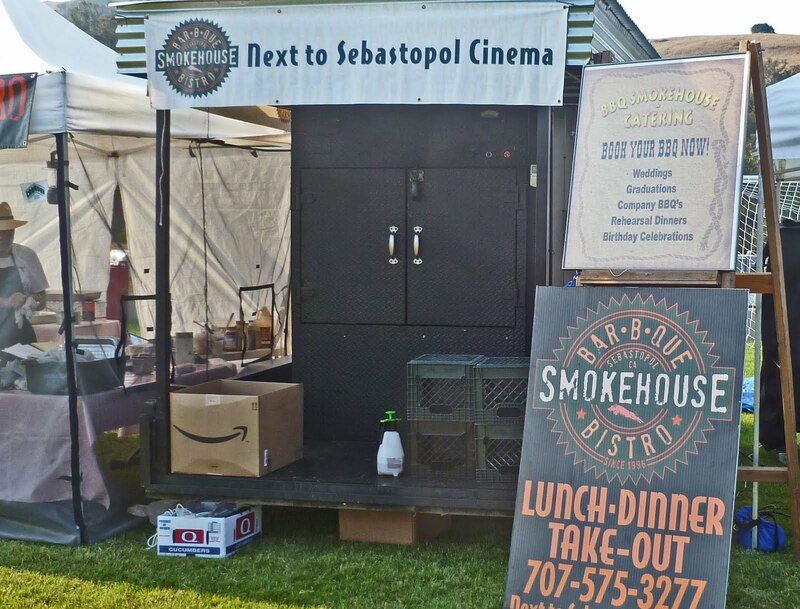 Several booths gave us a little taste to tease our palate. One vender put cut up onions on his fire. We talked and it made a little sense. Onions consist of mostly moisture and will help tame a hot fire. The smoldering onions with a little help from a blowing fan will also get peoples attention. Our appetites needed no encouragement. 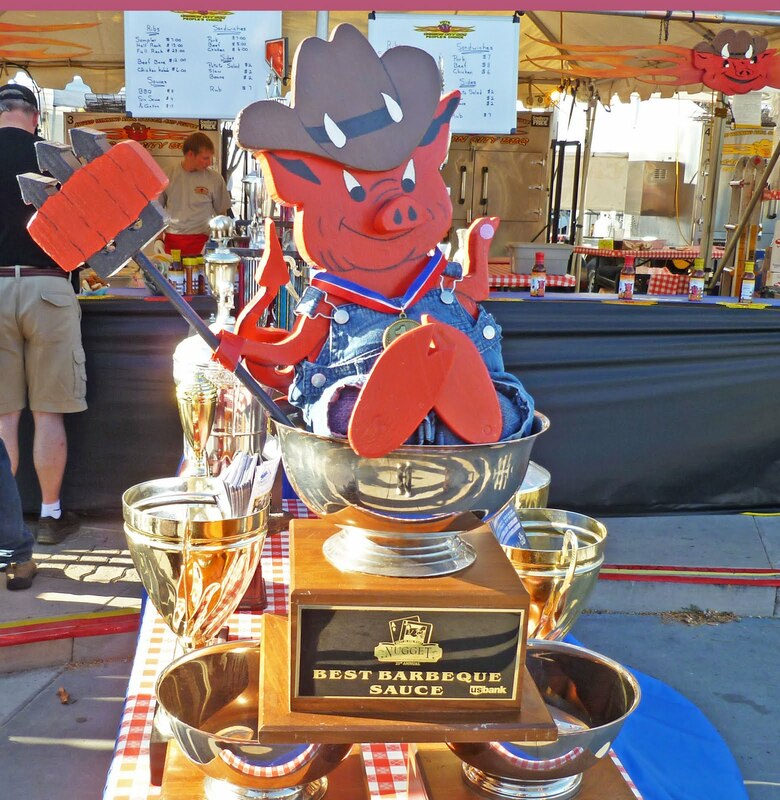 Wednesday evening was a rib eating contest. Joey Chestnut ate seven point six pounds of ribs in under twelve minutes. I may have eaten more but in a longer time frame. Several stages had various music groups to entertain. An area with many different craft venders with a barbeque theme invited us to spend and spend. 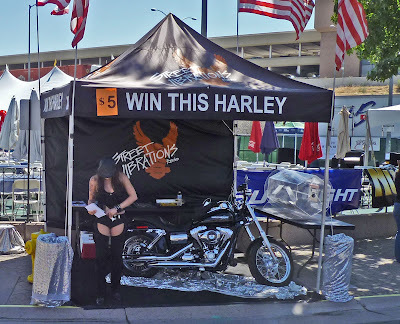 There was a raffle contest to win a Harley Davidson. I did not buy a ticket but took a gander. 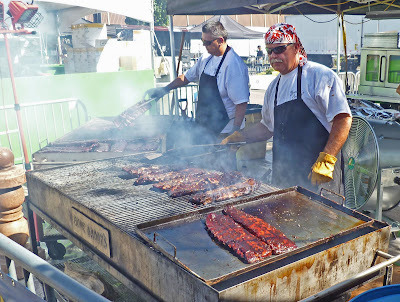 The Nugget Rib Cook-Off was a fun event. It was nice to take a short break from judging. The weather was in the mid eighties and that was fine with us. We plan to return next year and see Joey retain his title. Next weekend we will be judging in Santa Rosa California at the Wine Country Big BBQ. Hope you can make it.